EAGLE — Lots of people fantasize about taking a year away from work to pursue a grand adventure. But not many of us actually follow through with that dream. Deron Dircksen and Melissa Barbour of Eagle are an exception. 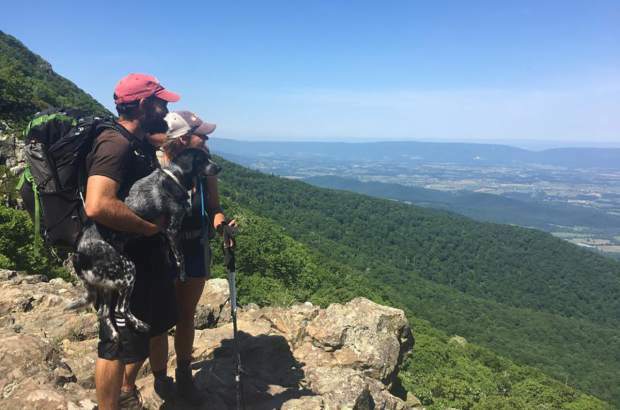 In 2017, the couple stepped away from their jobs and spent six months hiking the entire length of the Appalachian Trail. Their journey began on March 7 at Springer Mountain in Georgia and concluded on Sept. 9 at Mount Katahdin in Maine. Along the way they saw incredible scenery, experienced rolled ankles and sore muscles, were tortured by high humidity, avoided lots of snakes, made lifelong friends and shared a bit of trail magic. “When Deron and I started dating in 2016, and he already had pans to take a sabbatical,” Barbour said. Before long, he broached the idea of her joining him on a trek. As they fleshed out plans for a grand adventure, Dircksen and Barbour knew they had to work within a few parameters. One of the biggest was Kenya, their blue heeler mix dog. Because they wanted to bring her along, any trip they planned had to be dog-friendly. What’s more, because of the issues of transporting an animal to another country, they figured they would trek someplace in the United States. As they studied the options available, the couple was drawn to the idea of hiking the entire Appalachian Trail — all 2,189.8 miles of it. The trail passes through 14 states — Georgia, North Carolina, Tennessee, Virginia, West Virginia, Maryland, Pennsylvania, New Jersey, New York, Connecticut, Massachusetts, Vermont, New Hampshire and Maine. Because the trek takes months to complete, they decided to start south and work their way north. “If you make it to Virginia, which is about 450 miles, you are more likely to finish,” Barbour said. During their six-month hike, Dircksen and Barbour averaged around 18 to 20 miles a day. But on their first day on the trail, they only covered four miles. Weather had something to do with it. Temperatures were cold and there was still snow on the trail. As their hike progressed, they settled into a rhythm. They would spend four days on the trail, camping. Then they would hit a town to resupply and head out again. Dircksen and Barbour noted that for those who crave a solitary experience, the Appalachian Trail isn’t a good choice. They noted it is a social trail, with lots of hikers. As they made their way northward, they befriended other hikers. “We became a tramily — a trail family,” said Barbour. The nucleus of their tramily included “Lumberjack,” a 24-year-old female student from Maine and “Adele” a 30-year-old Alabama man. Kenya also made some dog buddies on the trail. Barbour said her favorite part of the journey was Shenandoah National Park in Virginia. When they hit the area in May, the rhododendrons were blooming and temperatures were warm but not hot. “It was also easier hiking,” she said. For Dircksen, Smoky Mountain National Park was the highlight. The B&B owner even let them drive grandma’s 1988 Buick into town to get groceries. That kind of hospitality is one of the great features of the Appalachian Trail. Barbour recalled how one man cooked omelettes and pancakes trailside in Maine. Dircksen said a simple ham and cheese sandwich from a Trail Magic tent was one of the best sandwiches he has ever eaten because it came at a perfect moment. “People who do this do it day in and day out and really, they just want to hear your story,” he said. Trail magic exists in other forms too. “We would lose a dog bowl and then a couple of days later, we would find one,” he said. One night the couple were camping out when a heavy snow fell. “The tent, as we were laying down, was within a few inches of our faces,” said Dircksen. The weight ended up snapping a tent pole, which had to be replaced. The couple went to the nearest town where they located a sporting goods store. The owner happened to have the same tent and he told the couple he was going to see the company representative in a couple of days. The businessman handed over the poles from his own tent, free of charge, saying he would be able to get a replacement. Barbour went through two pairs of hiking boots during the trek. Dircksen wore out five pairs of trail shoes. “The humidity was the worst part,” said Dircksen. “After four days out, we would smell so bad,” Barbour agreed. Sometimes slippery conditions resulted in rolled ankles, said Barbour. The only thing to do for a sprained ankle was to walk it off. “I only cried on the trail one time,” she said. Hiking a couple thousand miles isn’t a comfortable undertaking, but having little comforts along the trail is important, they both noted. Dircksen and Barbour said the day they reached Mount Katahdin was both the best day and the worst day of the trek. It was great to finally reach their destination, but it was also sad that their adventure was at its end. It was also a very momentous occasion. While they were trekking through New Hampshire, Dircksen had asked his mother to send his grandmother’s diamond. He had picked up the package at a post office they passed. Because they were periodically collecting packages at post offices along their route, Barbour was unaware of the impending proposal. She said yes. Now that they are back home at back at work — Barbour at Eagle County and Dircksen at the town of Eagle — the couple is still scratching their hiking itch. They are spending weekends hiking the Colorado Trail.